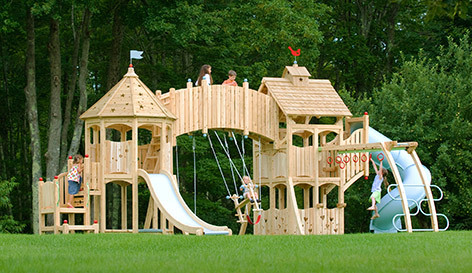 More than 30 years ago, CedarWorks revolutionized outdoor play with the first premium line of kid-friendly, parent-friendly, earth-friendly wooden swing sets. CedarWorks’ home, the midcoast of Maine, is a remarkable place where craftsmanship, technology, the arts, and unspoiled nature all thrive. 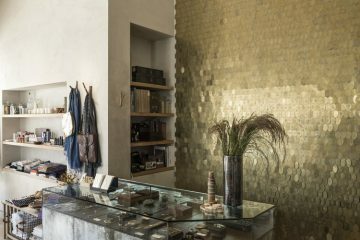 Their staff has come together from around the country and around the world with backgrounds in design, manufacturing, photography, technology and raising children. 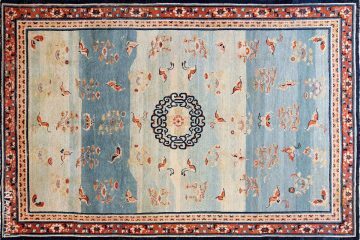 Most of all, CedarWorks employees have a passion for all that surrounds them, and their products are a reflection of where they live, who they are, and what they love to do. 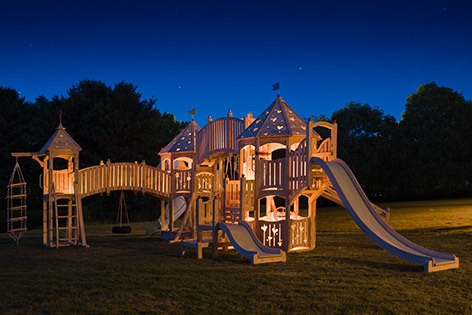 CedarWorks Serendipity Series of outdoor playsets combine exceptional play possibilities with aesthetic values usually only associated with the finest artisan-crafted furniture. 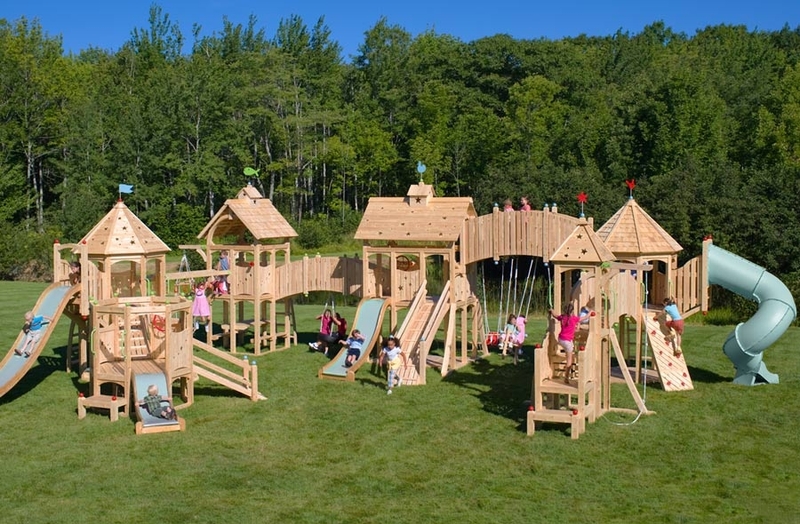 Made from Northern White Cedar, the only wood species that meets their discriminating requirements, Serendipity playsets are built for strength, long life, not to mention that they are splinter and chemical-free. 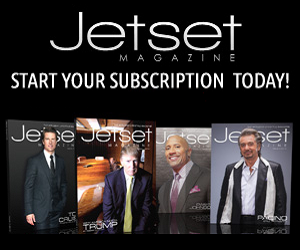 Designed by an internationally-renowned designer, Serendipity Series playsets will stand beautifully right alongside your other prized possessions. Extensive planning and design (and a fair amount of serendipity) have all gone into making this, the most beautiful playset you can buy. 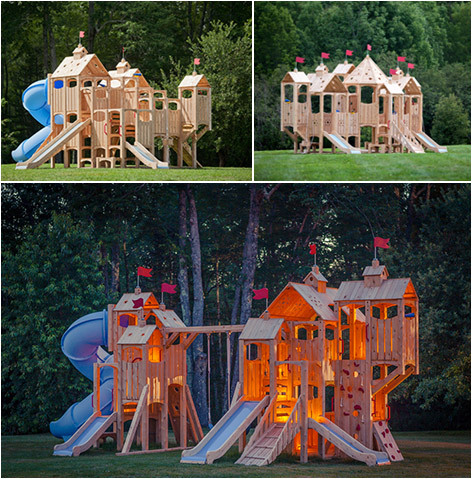 CedarWorks Frolic Series of outdoor playsets offers a unique modular system for unrivaled customization. Whether you are looking for a compact design for a small NYC rooftop space or a sprawling magical kingdom for your spacious backyard, Frolic’s endless design possibilities have something for everyone – the only limit is your imagination. Made from the same chemical-free, splinter-free, long-lasting cedar for which CedarWorks is famous, Frolic premium playsystems are the perfect fit for anyone looking to add beauty and durability to their backyard playscape. To complement their outdoor line, CedarWorks released their Rhapsody Play Collection in 2009. 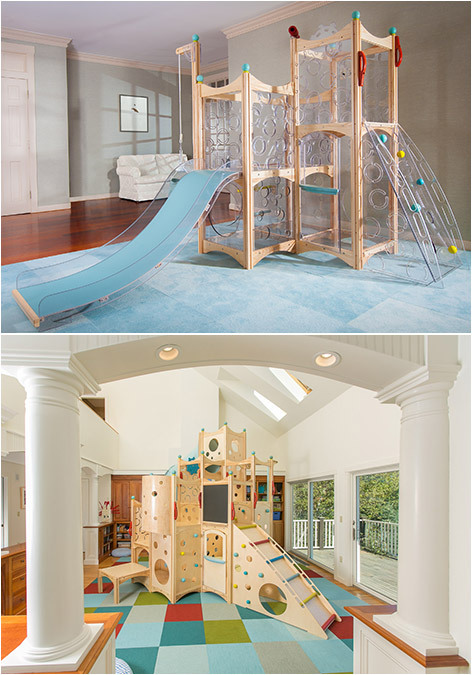 Seeing the need for indoor play options, they set out to design a line of indoor play equipment with optimal materials, finish, and scale for inside the home. The Rhapsody playset collection can snuggle into a cozy living room space or spread out into a spacious playroom. It can hunker down in a basement or soar towards the highest cathedral ceiling. 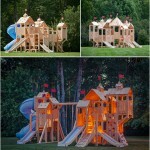 Choose a sleek, modern and hauntingly beautiful clear panel playset or a big, beautiful, fun, and functional playscape. 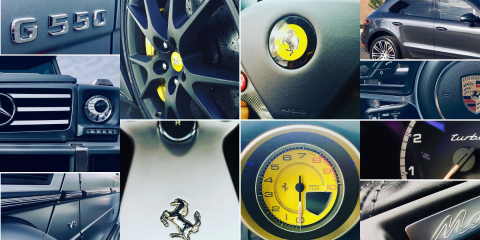 No matter the choice, you are assured countless hours of playful memories that will last a lifetime. With three deck heights, six panel designs, more than twenty accessories, and a modular design that allows for infinite combinations, it can be as unique and beautiful as the special person for whom it is being designed. From CedarWorks indoor playset design came one of the most architecturally beautiful children’s furniture collections available: Rhapsody playbeds. Every kid needs a bed. Every kid needs to play. 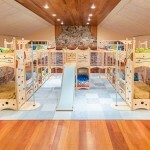 So why not design a playbed as whimsical and exquisite as the other furniture in your home? CedarWorks Rhapsody playbeds come in two loft bed heights and two bunkbed heights which can be combined with all of the various Rhapsody playsets components including climbing walls, ramps, firepoles, or slides to make getting in and out of bed extra fun. You can rest assured that whatever you choose, your kids will be playing and sleeping safely. CedarWorks designs and manufactures all Rhapsody products in Maine, using furniture-grade hardwoods, multi-ply laminated panels, and kid-friendly finishes. 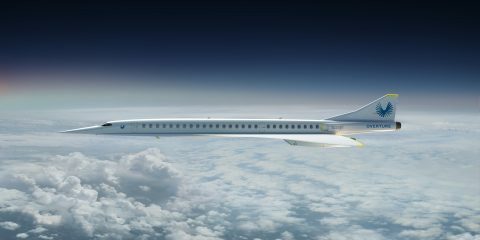 Imagine a family reunion at your ski chalet, beach house or private residence with a bunk space where the kids can play all day and sleep all night — all in the same room. Sounds like memories in the making. It is the complex curves of the slides, the simple arches between posts, and every dip and bend in between that transforms CedarWorks products into architecturally beautiful, functional, efficient, and durable play systems. 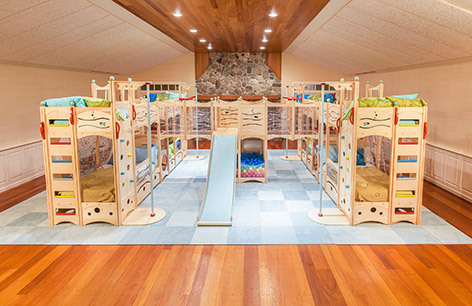 The colorful finials, fish scale shingles, whimsical flags and all the fanciful references to traditional elements ¬— combined with a large dollop of fun — makes CedarWorks play products among the best in the world. 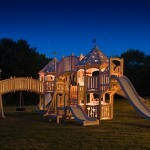 It has been said that watching your kids play on a CedarWorks playscapes is beautiful in more ways than one. We could not agree more.